For the remainder of the season, I’ll be changing out my “Runner” hat for the “Sideline Reporter Who Has No Idea What He’s Doing” hat. And in the spirit of this new title, I’m going to continue to ramble on like I’ve done all season, but now I’ll be able to offer a fresh (still nonsensical) perspective on the last few weeks of the season. So while our top seven take to Alabama’s Harry Pritchett Running Park cross country course on Friday to determine their future and the legacy they leave, I’ll be bounding around the course like a lame gazelle, carefully watching and taking notes of every moment of drama. And there typically is quite a bit of drama. Come to think of it, regionals really is the less cool version of the Thunderdome, where 20-30 teams enter and only two leave. But until that gun goes off, signaling the start of 10,000-meter long battle between underfed cross country runners, where the casualties will be numerous, I’ll have to just speculate what will happen. 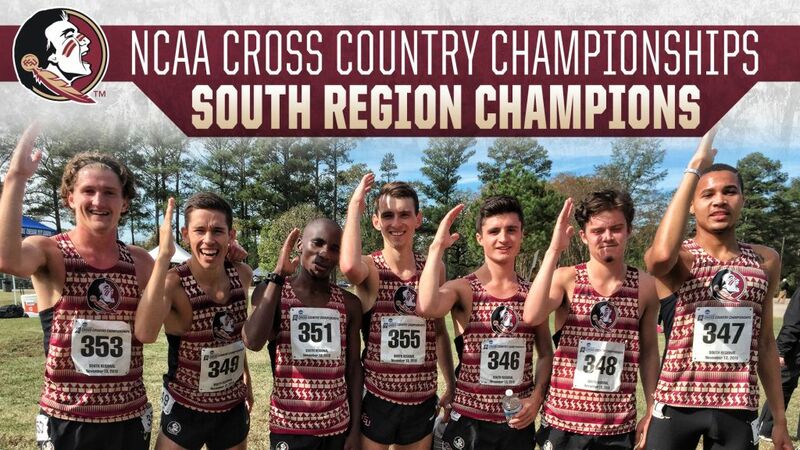 Listen, if you’ve followed Florida State cross country in the past, then you’ve probably been inundated with the same phrase for years; this team trains for the 10k distance. Hearing this might sound like the broken record player that you pulled out of storage because it’s cool again that plays the same song over and over again, but to us, it’s the sweetest song there is. This team is out there on the trails from August to November trusting the training, even when our patience is tested at races earlier in the season where we get our faces pushed in the mud by lesser teams because we peak for the last two races of the season. In this program, we’re forced to trust the process. Incidentally, it’s a proven process. So in keeping with the theme of platitudes offered up by someone who has no business throwing out wisdom of any kind, to be a Seminole of Florida State, you need to only remember that this is an opportunity, not an obligation. Each day of pain, of monotony, of sweltering heat that makes the PowerAde taste like it came from the Fountain of Youth were in fact, minute opportunities only disguised as misery. Every time these guys looked at their own tired faces in the cloudy bathroom mirror at St. Marks Bike Trail before nine- and 10-mile tempo runs were really opportunities to be great come November. It’s the opportunity that gets the runner out of bed each morning. It’s the opportunity that makes the runner stay the extra hour in the training room. And it’s the opportunity that will propel them along 10,000 long meters. No one is corralling our guys like cattle to the starting line – they know they don’t have to be here. They stand with their toes to the line, squinting across the field towards the first hill and imagining the painful ride they’re about to embark on because they want to. From the first guy to the seventh, they are all thinking the same thing: Nationals. It’s this unwavering belief that these guys have that makes me feel comfortable with my first prediction as a sideline reporter – that you will see a group of Florida State runners walk away from the finish line with smiles on their faces. They might be bruised, bloody, and battered, but they are going to be one of the two teams walking out of the Thunderdome. Bryce Kelley, a graduate student in Integrated Marketing Communications, is a fifth-year Seminole from Hope Valley, R.I. A two-time All-ACC Academic selection in cross country with his undergraduate degree in Creative Writing, Kelley will be providing a weekly inside look at the FSU men’s team throughout the season.